Costume Jewelry Designer Kenneth Jay Lane Dies At 85 : The Two-Way Lane designed costume jewelry for Hollywood stars, Jackie Kennedy Onassis and viewers of TV's shopping channel QVC. Many women wore his fakes, or "faque," as he pronounced it, with their real gems. 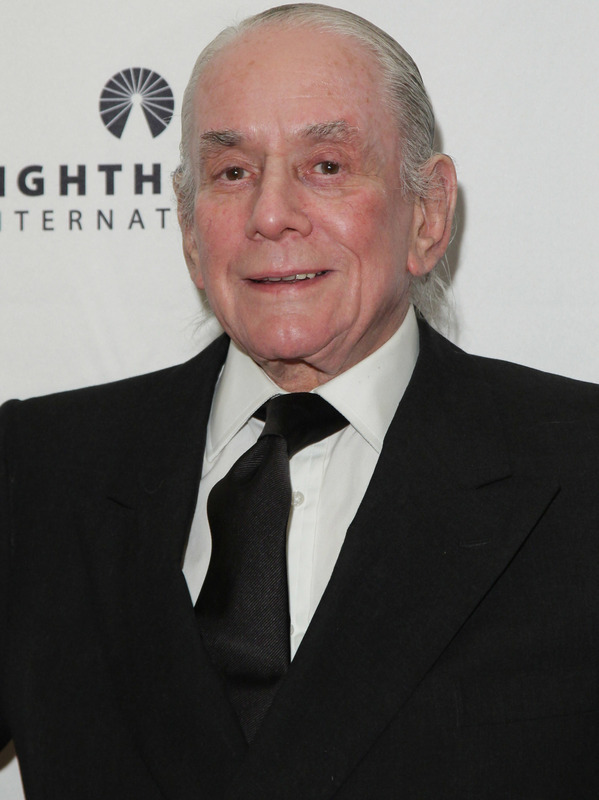 Designer Kenneth Jay Lane, shown in 2010, designed costume jewelry for Hollywood stars, Jackie Kennedy Onassis and viewers of TV's shopping channel QVC. Kenneth Jay Lane turned designing "fake" jewelry into a global business. He didn't take himself too seriously — joking that his costume jewelry wasn't fake or junk. Instead, he would pronounce it "faque" and "junque." Lane died in his sleep at his home in Manhattan, according to Chris Sheppard, executive vice president of Lane's company, who says it has not been determined whether he died Wednesday night or Thursday morning. Lane was 85. "Lane changed the landscape of costume jewelry, adding souped-up color, drama, luxury and a wide variety of ethnic motifs, and making it exclusive. Many of his customers combined his pieces with their "real" jewels... and it was often impossible to tell the difference. As he once put it, "Our jewelry is designed for people who want to be noticed." "The designer would give earrings and pins to his most photographed client Jacqueline Kennedy Onassis that he thought she would like. And former First Lady Barbara Bush wore his three-strand necklace so often she said that, if she took it off, her head would fall off." "His designs resonated with these high-profile women because he approached costume jewelry as if it were couture, with bold colors, dramatic silhouettes, and quality "jewels" that often looked real, despite being glass or plastic. Of course, his outgoing personality helped, too; friends of Lane will recall his charm and quick wit. He once famously said, "I am myself a fabulous fake." A wider jewelry buying public got to know Lane on QVC, a home shopping channel. "We are saddened to learn of the passing of Kenneth Jay Lane. He will be greatly missed by all who knew him, but his legacy will live on through his designs. We are thankful to have spent more than 20 years with Kenneth as a part of our QVC family, and our thoughts & prayers are with his loved ones during this difficult time." A documentary film about the designer, called Fabulously Fake: The Real Life of Kenneth Jay Lane, is expected to be released in 2018. "In the film, Collins recalls a time when she was stopped at customs with her KJL jewels and even the customs official couldn't stop complimenting her about the baubles. "I was going through customs in Mexico — I keep all my jewelry in a box in my wheely — and the customs man saw it and said, 'Let me open it. Let me see it.' He looked at it and I said, 'Can we go into a private room? Because I don't want people to see it,' even though it wasn't real," says Collins. "We went into the private room, and the customs man is picking it up and said, 'Very nice, these earrings very good.' Finally, I said, 'It's not real, you know. It's not diamonds and gold and rubies; it's faux jewelry. And finally he closed it and said 'You have very nice stuff here!'" At age 85, Lane had no plans for slowing down. He recently told The Hollywood Reporter he had been busy focusing on his e-comm site, which offers affordable tassel earrings, pearl necklaces, bold cuffs, embellished brooches and cocktail rings.